Oh Hey There! : Beauty || Bourjois Rouge Edition 'Aqua Laque' Review. Beauty || Bourjois Rouge Edition 'Aqua Laque' Review. Left to Right: Bourjois Rouge Edition Aqua Laque in No. 07 Fuschia Perche and No. 02 Rose on the Rocks. The Bourjois Rouge Edition Velvets have been one of my favourite beauty products of the past 12 months. I wear the nudist shade almost everyday and it has become my go to lip product. So when I found out that Bourjois would be releasing the Aqua Laque I was probably way too over excited! As they are a brand new release it took going to a few different branches of Boots and Superdrug (I was on a serious mission) to find them. The difference between the Rouge Edition Velvet's and the Aqua Laque's is the texture. The Aqua Laque range is glossy rather than matte and much lighter than the Velvets range. I was a bit unsure about how it would translate to the glosses but I am very much a fan. The texture of them is just unreal! They manage to be both silky and buttery but also feel like water on the lips. There is something quite luxourouis about the texture and I have become a little addicted to just layering it on gratuitously! Something that often puts me off about glosses is their texture, I find just about every lipgloss too sticky, heavy or just uncomfortable to wear. I want to be able to use a product and not keep being bothered by it throughout the day. These are lightweight but not at all drying, actually feeling hydrating and nourishing. I know that I can put it on and not have to worry about it smudging or getting my hair in it or it just being very conscious of it, as I am often am with glosses. The shade range is, again, spot on. There are two sections to the colour range, statement nudes and statement bolds, four in each. I think the range of shades is very well considered and definitely has something for everyone! I chose one from the statement nudes and one from the statement bolds and currently have the No. 2 Rose on the Rocks and the No.7 Fuchsia Perche shades. I was instantly drawn the the No. 2 Rose on the Rocks shade as I could tell that it will just be such an amazing colour for spring. It is very soft but still really brightens and lifts the lip. I was very torn between the No. 07 Fuchsia Perche and another shade that was more of a classic pillbox red, but I felt it was a little more adventurous and different to anything else I owned. The shade has not come out so great on the picture as it is a little pinkier in real life! Again, like the matte version, the packaging is great. Great shape, great size, aesthetically pleasing but also practical. I also like how tough and robust the packaging is as well. They seem to be pretty scratch resistant, considering I take them everywhere with me I have yet to see any damage. I am very confident that I will never find one exploded at the bottom of my bag! 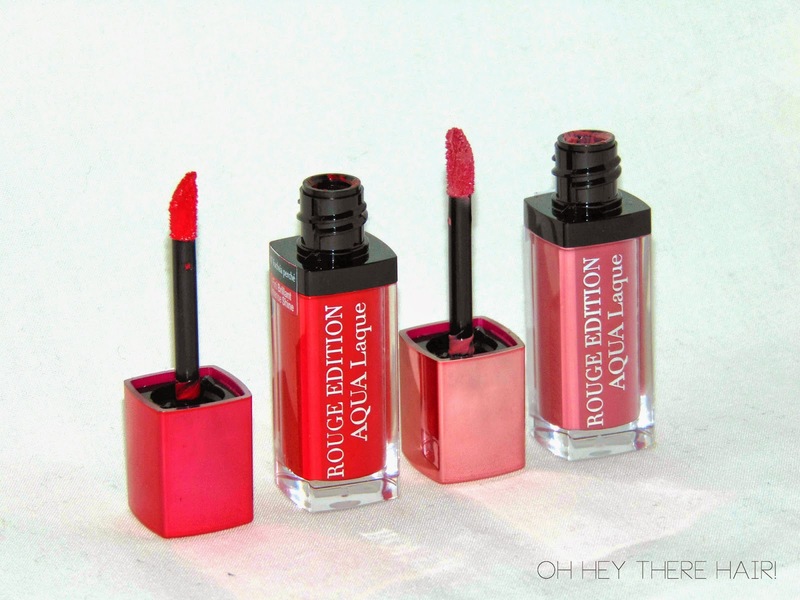 Have you tried the Bourjois Rouge Edition Aqua Laque yet? i love the number 07 i think i have something similar, any kind of red is great but this season I think extra bright reds are perfect!